Why performance groups? The Hepcats believe that competition type activities (of course, friendly and fun competitions), particularly performance group activities, are beneficial to helping improve any Lindy Hop/Balboa swing dancer. One of the best ways for an individual to take their swing dancing to the next level is to participate in a performance group, in jam circles, in a couples or jack & jill contest, etc. These activities get the competitive juices flowing and are often the catalyst for individual improvement. The Hepcats also believe that performance group activities are one of the signs of a healthy and growing swing dance scene. 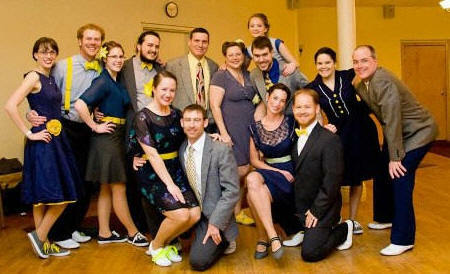 From 2008-2013, Mike & Mary/the Hepcats sponsored numerous Lindy Hop performance group and competition type activities. Unfortunately, the current state of the swing dance scene in the Lexington/central KY area is not conducive for such activities. Could that change in the future? Who knows……. For those interested in previous/past Hepcats Lindy Hop performance group activities and information, see the info below. ◊ Mission: The mission of Hepcats performance groups is to provide a creative, fun and safe outlet for those swing dancers that want to participate in a Lindy Hop performance group, and take their Lindy Hop swing dancing to the next level. ◊ Who participates? Participants in Hepcats performance groups normally include a diverse group of people (past participants have included all ages from college students to grandparents! ), but we all have some things in common: a love of Lindy Hop; a desire to perform and share that love with others; and a desire to take our dancing to the next level. ◊ The Hepcats sometimes sponsor not one, but two Lindy Hop performance groups: the Rhythm Cats and the Razz Ma Tazz. The Rhythm Cats is a Lindy Hop performance group sponsored by the Hepcats Swing Dance Club. 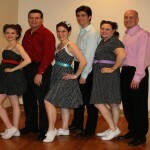 Established by Mike & Mary Richardson via the Hepcats in 2008, the Rhythm Cats have competed and performed in local, regional and national level competitions and events and consisted of the best Lindy Hoppers in the Lexington/central Kentucky area. And most of those dancers got their start with the Hepcats! During the times the Hepcats sponsored two performance groups, Razz Ma Tazz team members generally consisted of Hepcats performance group members with less competition and performing experience (although some Rhythm Cats members did fill in for a Razz Ma Tazz routine from time to time). Many Razz Ma Tazz members moved up to the Rhythm Cats after learning one or two Razz Ma Tazz routines. What’s it like to put together / lead a performance group? What’s it like to put together / lead a performance group? To quickly summarize: the great times, the good times, the not so good times; the trials, the tribulations; the thrill of victory, the agony of defeat; the different personalities, and yes, sometimes (okay, a lot of times) the drama – – and that was only the first rehearsal! Overall, it was certainly enjoyable, and it was a big factor in raising the technique and level of expertise of all the participants. (Perhaps one day we’ll get our thoughts together and put down “on paper” more of the lessons learned, useful tips, pearls of wisdom, etc…..for organizing and leading a performance group. Check back, or feel free to contact Mike or Mary if you’re interested in that type of discussion). Contact Mike Richardson, 859-420-2426, info@luv2swingdance.com for any questions about Hepcats performance group activities.